The story of Max Blessinger and Ethan Patrick’s rise to stardom is similar in many ways. 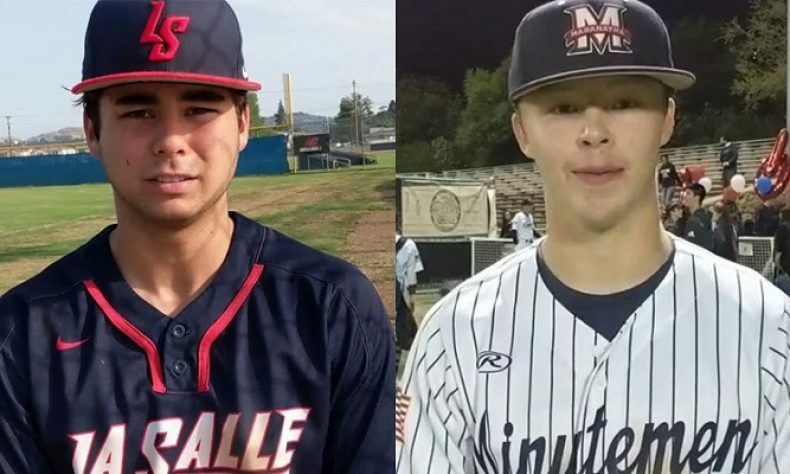 Neither the Maranatha junior (Blessinger) or the La Salle senior (Patrick) are big guys, and yet both play giant roles in the success of their programs. Patrick has great range at shortstop and makes tough plays look routine, and Blessinger uses his instincts and athleticism to excel at second base for the Minutemen. Blessinger led the entire area with 52 hits in 2018 and Patrick was second with 48. 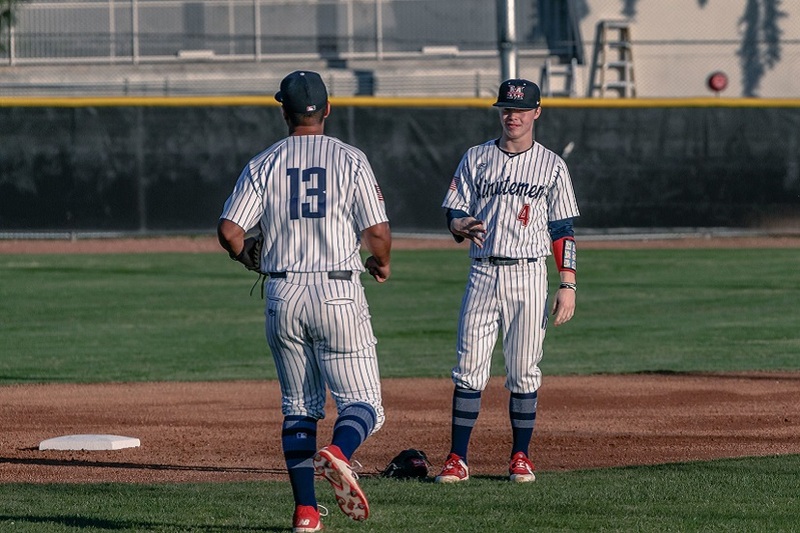 Patrick is set to play for Loyola Marymount in 2019 and Blessinger has one more season to rewrite the record books at Maranatha and then he’ll be off to Dallas Baptist University in 2020. Both have solid home lives with great and supportive parents, and each are intelligent kids, who share an equal love for baseball and their teammates. 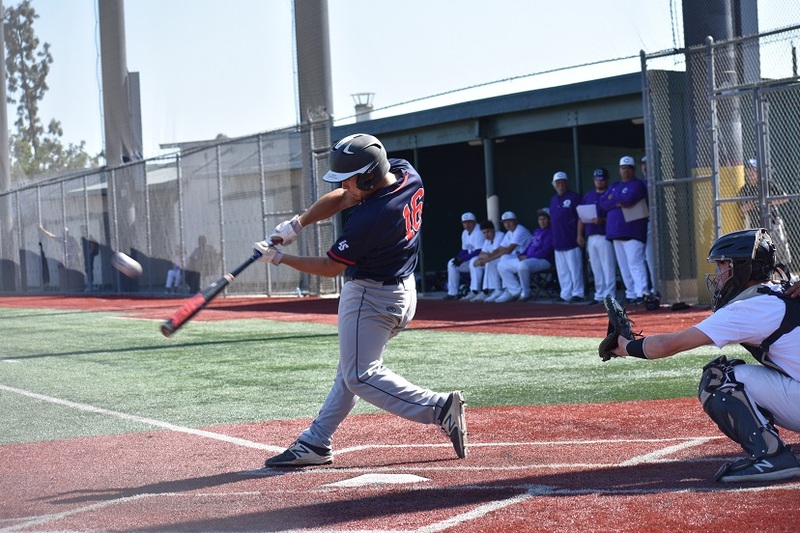 Blessinger had a much deeper supporting cast, and he drove in three of his team’s four runs in Maranatha’s 4-2 victory over La Salle in the championship game last weekend. Patrick carried La Salle’s program on his shoulders and the Lancers’ appearance, let alone their having a chance as the unranked opponent of the top-seeded Minutemen says a lot about the 18-year old star and his teammates. Aside from Maranatha’s Dawson Netz, who is the 2018 Pasadena Sports Now Most Valuable Pitcher, no two players were expected to do more day in and day out than Patrick and Blessinger. And the great thing about this middle-infield duo from different programs is that they’ve both been ‘the man’ for the last three seasons. They are also very much good friends and one of each other’s biggest fans. For their production, their success, their work ethic, their leadership skills and the way they approach the game and represent their families, schools and programs, Patrick and Blessinger have been named the 2018 Pasadena Sports Now Most Valuable Players. Patrick led La Salle in all three seasons he played at the varsity level in hits and Blessinger has in his freshman and this, his junior season. We’ll start with Patrick first, or EP, as we call him. Ethan Patrick led La Salle (18-10) with his .460 batting average and 48 hits. He scored 23 runs and drove in 24 for a Lancers’ offense that collectively didn’t exactly beat up opponents’ pitching staffs. In fact, he and Brennen Mace were the only two hitters in the lineup that consistently stayed over the .340 mark, let alone well above the .400 mark, where both seniors finished. Patrick had 10 doubles, six triples, one home run and an on-base percentage of .540. Since his sophomore season, EP has been No. 1 in hits all three years and tops in average both last year (.442) and in 2018 for La Salle. He’s been part of 58 wins for a program that has seen three coaches in four years and has been the rock of that franchise. His three-year career numbers are really impressive. Patrick had 121 career hits, 61 runs scored, 51 RBIs, 27 doubles, 13 triples and three home runs, and all while hitting (collectively) above the .420 mark during his time at La Salle. As much as he’s played the role of hero, and is a guy that fellow senior Jeff Daley refers to as ‘the team,’ Patrick not only respects his teammates, he genuinely loves them and his coaches. Zane Lindeman has been incredible with 23 wins over the past three years, especially in big games, Jeff Daley came into his own this year with six big wins and three saves, and the biggest surprise on the mound was Landon Smith, going 6-2 with a 1.50 ERA in his first and only varsity season. Another guy who deserves a lot of credit for this run is Brennen Mace, the reliable catcher, who this season also became a threat at the plate. Mace hadn’t hit above .141 for his career and almost tripled that this season, which included over 30 hits, 23 RBIs and a huge postseason. Mace hit a three-run home run in the first inning of the first round at Charter Oak, and a two-run double in the first inning of the D3 final last Saturday at Cal State Fullerton. To even get to this point, it’s impossible not to go over the real-life scenario where La Salle was close to missing out on the playoffs. 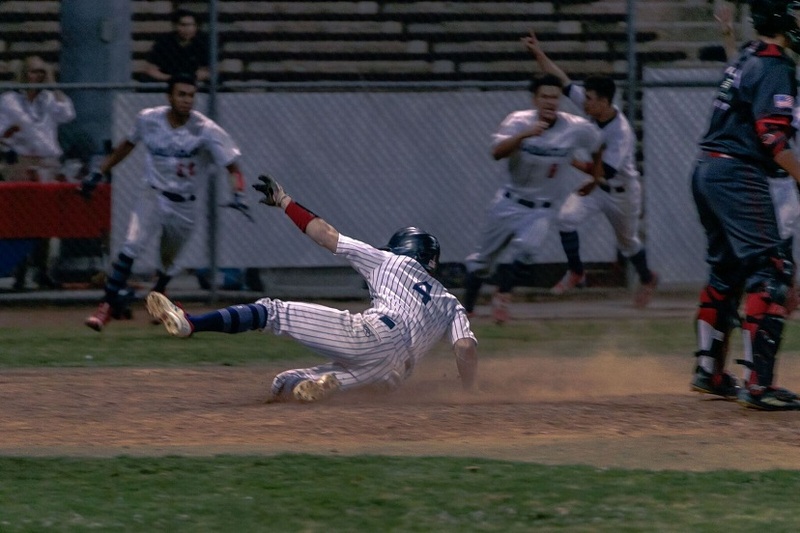 With two weeks left in the regular season, the Lancers dropped two one-run games against a St. Paul team they shouldn’t have lost to, and they fell from second to third place. On top of that, undefeated (in league) Bishop Amat, their hated rivals from La Puente were coming to town for a pair of games and could all but end La Salle’s hopes of playing in the postseason. But to their credit, the players, the coaches and all involved sat down for what turned out to be a season-saving and season-making meeting, and after two-game sweeps of both Amat and Cathedral, it was off to the CIF-SS Division 3 playoffs as the unranked and unseeded underdogs. La Salle took out Charter Oak, Temecula Valley, Temescal Canyon and then provided some drama that even Hollywood could not have written against Long Beach Wilson in the semifinal round. Long Beach Wilson held a 2-0 lead in the bottom of the fifth inning with two on and two out and Patrick at the plate. He drove a two-strike single out to right field and the Bruins’ outfielder overran the ball, and here came two runs to tie the game unexpectedly, but right when the La Salle players were celebrating the 2-2 tie, they forgot No. 16 was No. 16. Patrick never stopped from his first stride to his last when he dove head first just before the Wilson catcher applied the tag and that third run ended up being the difference. And while the next round, the 4-2 loss to Maranatha wasn’t how he had hoped to end his prep career, Patrick will let his play do all his talking, and it will speak volumes and do so loudly. Patrick is very close with former coach Mike Parisi, who he wants to thank for all the support and guidance, and he’s also appreciative of the current Lancers’ skipper, Eddie McKiernan, for stepping into a tense situation and handling it as well as anyone could have hoped. “Both coaches have been incredible to me and helped me become better, and I want them both to know how much their time and effort and concern means to me,” Patrick said. In the playoffs, Patrick shined his brightest with an area-best 10 hits, including that one against Wilson that won’t soon be forgotten. Plainly put, Ethan Patrick is a ballplayer’s ballplayer. He approaches and plays the game in a way that even opponents or rivals respect. He’s left a legacy for guys that might be considered undersized that with hard work, they too can be as elite as someone 6-foot-3 and 210 pounds of muscle. Said Patrick: “”I could have never thought after we lost two games against St. Paul (late in the season) that we’d somehow make our way to the finals and playing for a championship against Maranatha, but we did, and to turn our season around and make history with guys I love like brothers is something I’ll never forget. Max Blessinger is just a guy that grinds it out 24/7/365. One year after hitting .421 with 40 hits, the Maranatha junior and leadoff hitter came back to school more rocked out physically, but his tan hadn’t gotten any better. All jokes aside, his body, he said, played a big role in maintaining his excellence over the entire season, which included a CIF-SS Division 3 championship. It was the school’s first CIF title in eight years and Blessinger had two hits and three RBIs in the 4-2 victory over Patrick’s Lancers from La Salle at Cal State Fullerton. He also went from 19 RBIs to 26, from eight doubles to 13 and doubled his triples from two to four from 2017 to 2018. His three-year run thus far would rival nearly anyone and he’s still got one more season to go before heading to Texas. Blessinger already has 128 career hits with at least 30 games to play in 2019, and the chance of becoming one of the 10 most accomplished hitters in state history if he continues his torrid pace. This season alone, ‘Maxy’ as we call him, led the entire area with 52 hits, he scored 37 runs and drove in 26, which is incredible for a leadoff hitter. Blessinger had 13 doubles, four triples, 31 stolen bases and an on-base percentage north of .530. If that weren’t enough, his coach, Matt Shupper, called upon the second baseman to do some pitching when they needed it, and he went 4-0 on the mound with a 2.57 ERA. His final outing wasn’t his shining moment, after allowing two runs and leaving two on with only one out in the D3 title-game last weekend against La Salle. But he got some help from Will Downing, who extinguished the fire without any more damage and then Max did what Max does. The area’s most prolific hitter in 2018 came up in the bottom of the first inning and singled, and in the fourth, his bases-clearing double to the wall near right-center field turned out to be the difference in the 4-2 victory. That double gave Maranatha its first lead of the game and did so at the perfect moment, because it happened in the bottom of the fourth inning and the area’s best pitcher, Dawson Netz was able to use up those final three innings of eligibility for the week and easily closed out the championship. Blessinger got a lot of help from guys like Dawson Netz, who had a season from outer space, going 12-0 with a 0.26 ERA, 117 strikeouts and a 59-inning streak without giving up a run. Marco Martinez hit .405 with 32 hits and drove in a team-best 28 runs. Casey Popham (.385), Dawson Netz (.365), Sal Tabullo (.358), Nick Iverson (.333) and Brock Vradenburg (.329) all helped contribute offensively. And you can’t forget Will Downing, who went 4-0 with a 0.20 ERA, who allowed one earned run all season. But Blessinger has, because of an intellect, a love of the game, and a work ethic, put himself in the highest of company over the past season, and with 2018 being his best so far. It should also be noted that he was part of a Maranatha team that went 12-0, including a three-game sweep over Village Christian to wrap up an Olympic League title, and they finished 2018 on a 20-game win streak. He is also a kid who is nearing the 100-stolen base mark for his prep career. Just seven days removed from a championship, he’s out in Goodyear, Arizona playing travel ball in 111-degree weather with the hopes and desire of finding a way to keep taking his game to an even higher level. Blessinger said how much his parents, his teammates and coaches have meant along this journey, and that none of this could have been done without each of them. 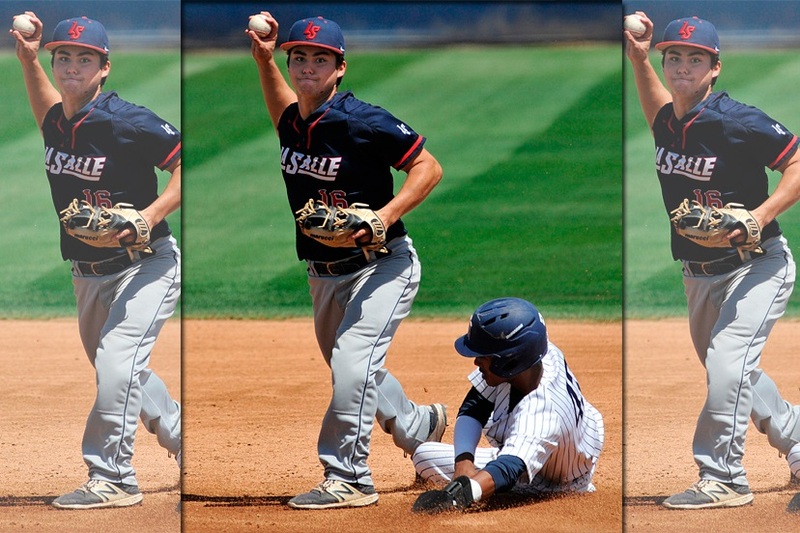 He also said his favorite moment of the season individually was the double that cleared the bases and ended up being the difference in the D3 title game, and the memory he’ll take with him most is celebrating on the team bus on the way back home from Fullerton to Pasadena. Said Blessinger: “I’m always looking to get better and as good as this year went, there are things I know I can improve on. Just from last year to this year, the work I did with weights turned what would have been a single last year or a fly out into that double that scored three runs in the championship game. 2018: 460 average, 48 hits, 23 runs, 24 RBIs, 10 doubles, 6 triples, home run. 2017: 442, 42 hits, 21 runs, 20 RBIs, 12 doubles, 7 triples, 2 home runs. 2016: 330. 31 hits, 17 runs, 7 RBIs, 5 doubles. 2018: 495 average, 52 hits, 37 runs, 26 RBIs, 13 doubles, 4 triples, 31SB. 2017: 421, 40 hits, 36 runs, 19 RBIs, 8 doubles, 2 triples, .36 SB. 2016: 400, 36 hits, 29 runs, 13 RBIs, 4 doubles.